The Lewis and Clark Expedition traveled down the mouth of the Columbia River in 1805 to complete their mission of reaching the Pacific Ocean, and it was 5 miles away across Youngs Bay that they spent the winter and erected Fort Clatsop. John Jacob Astor, the town’s namesake, built Fort Astoria in 1811 for his American Fur Company, and it became the first U.S. settlement on the Pacific Coast. For the five years between 1813 and 1818 the British occupied Astoria and renamed it Fort George, hence the name for one of the town’s most popular breweries. In 1847, before Portland had even been officially incorporated or the Denny Party ever reached Alki Beach in Seattle, Astoria built a U.S. Post Office, the first west of the Rocky Mountains. At one point, approximately 30 fish canneries lined Astoria’s north shore and canned more salmon than anywhere else in the world. Although fishing still plays a major part in Astoria’s economy and culture, much of the industry started to slow down by the 1940s as salmon stocks steeply declined, forcing many of the canneries to switch to the newer discovery, off-shore albacore tuna such as that produced by well-known Bumble Bee Seafoods. By the 1980s, much of Astoria’s salmon industry came to a halt. 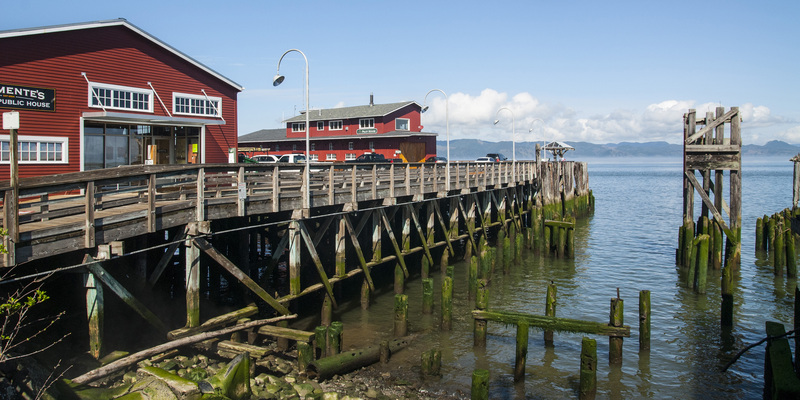 All this incredible Astoria history can be discovered and witnessed on the Riverwalk Trail, a boardwalk and paved trail that follows Astoria’s trolley line and riverfront pier system for just over a mile. You’ll see historic cannery buildings, piers from burnt and abandoned canneries (the White Star cannery boiler still remains off-shore at the end of what used to be 1st Street), Columbia River Bar pilot boats, the Coast Guard Cutter Steadfast WMEC-623 (part of the Columbia River Maritime Museum), observation platforms, interpretive kiosks, cafes, breweries, the Astoria-Megler Bridge (the longest truss span bridge in the world), along with the sights and sounds of countless California sea lions. Once a full trolley service transporting passengers between Astoria to Seaside, the Astoria Riverfront Trolley dates back to the 1880s. In fact, before highways and roads were built cutting through the Coast Range, vacationers from Portland would would travel up the Columbia River via ferry and then travel via these tracks onward to the beach. Before the city of Astoria took over ownership in 1996, the tracks were owned by the Burlington Northern Railroad, which bought out the trolley’s original owner, the Spokane Portland and Seattle Trailway. Today, the Old 300 Trolley car (built in 1913) runs daily from 12 p.m. to 6 p.m. between Memorial Day and Labor Day during the summer and during some holidays during the off season. Call 503.325.6311 for schedule and pricing details.